Bloggers the globe over report today -- and you can hear the snickering -- that Apple's flagship handset outsold Samsung's during fourth quarter. That's because Strategy Analytics director Neil Mawston told them so and they didn't really look carefully at the data: "Apple’s iPhone 5 overtook Samsung’s Galaxy S3 to become the world’s best-selling smartphone model for the first time ever in the fourth quarter of 2012". Tsk. Tsk. Strategy Analytics mixes "bestselling" with "shipments". They are not the same thing. Shipments refer to units going into the channel (carriers and dealers), while sales refer to product purchased by users (businesses and consumers). Only Gartner measures actual phone sales, so why does Mawston use bestselling in one sentence referring to shipments in another? Heavy iPhone 5 shipments during the launch quarter makes loads of sense. Apple needs to stock the channel in anticipation of new sales. Samsung shipped fewer S3s, given earlier channel build up for the holidays and anticipating Apple competition. 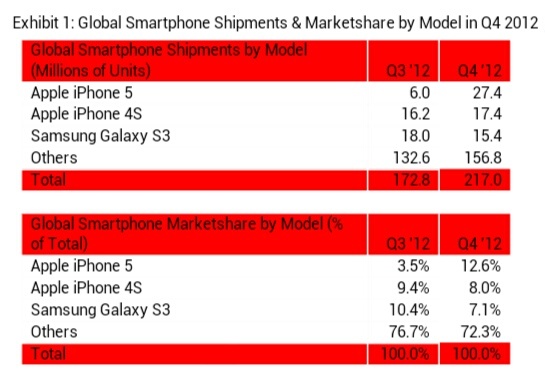 Third quarter tells part of the story, when Galaxy S III shipments exceeded iPhone 4S. Apple shipments declined ahead of the new release -- clearing old stock for the new. Consider this: When Samsung needed to stock the channel for S3's global rollout, shipments tripled in just one quarter. "Apple’s iPhone 5 smartphone model shipped an estimated 27.4 million units worldwide during the fourth quarter of 2012", Mawston says. Emphasis: shipped. "The iPhone 5 captured an impressive 13 percent share of all smartphones shipped globally and it has become the world’s best-selling smartphone model for the first time ever". Two things: The aforementioned mixing of "shipped" and "best-selling smartphone" and use of "first time ever" as exclamation, which the Apple Fanclub burst-blogged today. This isn't the first time for iPhone to be tops, just the new model and during the global launch quarter. "In addition to the iPhone 5, Apple shipped an estimated 17.4 million iPhone 4S units for 8 percent smartphone share globally in Q4 2012. 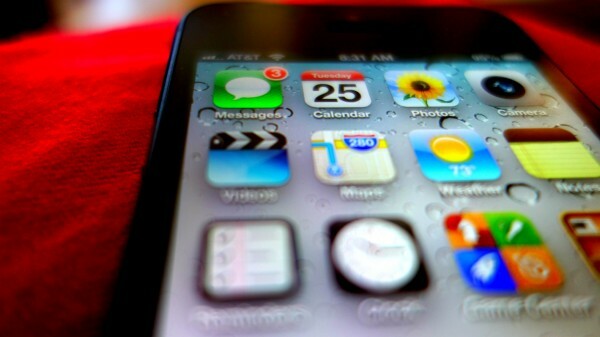 Apple’s iPhone 5 and iPhone 4S are currently the world’s two most popular smartphone models", Mawston says. No. 1 and No. 2 is impressive, I agree, except Apple also had to restock iPhone 4S, in anticipation of increased demand, because of price cut to $99 from $199 for the 16GB model. "Apple’s iPhone 5 and iPhone 4S together accounted for 1 in 5 of all smartphones shipped worldwide in Q4 2012", Mawston says. "We estimate Samsung’s Galaxy S3 was the world’s third best-selling smartphone model and it shipped 15.4 million units globally, capturing 7 percent share in the fourth quarter of 2012". He rightly observes: "Global demand for the Galaxy S3 appears to have peaked". Right. Peaked. Which is another reason for Samsung to cut back shipments rather than overstock the channel. During third quarter, with iPhone 4S falling off with rumors roaring about its successor, Samsung shipped 18 million S3s, claiming the top spot. Apple shipped just 22.2 million smartphones -- 16.2 million of the 4S and 6 million of the 5 (seeding the channel for limited September launch). Repeating Q4 numbers: Samsung reduced shipments, for the aforementioned reasons to 15.4 million, while Apple increased them to a staggering 44.8 million iPhones 4S and 5 combined. Right, nearly three times more than S3. I would reasonably assume, based on Apple's stated inventory numbers during last month's earnings call, that both iPhones together outsold Galaxy S3 during Q4. To say either one did is a stretch without data showing how much inventory Samsung carried forward from Q3 or how much stock remained at the end of the year. The numbers misrepresent sales for another reason. Apple sells three base iPhone models -- 4, 4S and 5. Just in the United States, Samsung offers more than a half-dozen smartphones, including Galaxy Note II. Globally, Samsung sold, not shipped, 64.5 million smartphones during fourth quarter, according to Gartner. By comparison, Apple: 43.5 million. I don't believe Mawston tries to mislead anyone. Bad choice of words is the problem. Greater fault lies with bloggers and others regurgitating the data without examining the contents.